A nursing cow was taking a stroll on her owner's property when she decided to run away from an eager bull's advances - and suddenly found herself in a muddy situation that was more than she bargained for. On Tuesday in Lawrenceburg, Kentucky, members of the Anderson County Fire Department, along with the department's large animal rescue, made a joint effort to save the cow, who had unfortunately fallen into a pond. The cow was unable to get out on her own, but her head remained just above the water line, preventing her from drowning. 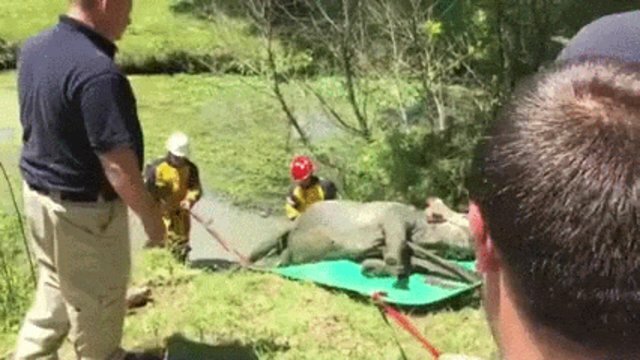 In a video shared with local news outlet Lex 18 by the fire department, the cow's rescuers were able to get her out of the muddy pond by first sliding her onto a tarp and then using rope to pull her until she was back on dry land. The rescue took over an hour. During the course of the rescue, the mother remained calm - however, her baby was not. "She had a calf that was bawling the whole time," Chris Harrod, battalion chief with the fire department, told The Anderson News. Reportedly, the cow appeared to be fine after the rescue (besides being slightly tired) and was returned to her owner, who allowed her to rest. The owner said he'd keep watch over the cow should she need to see a vet.